COLLEGE PARK, Md. 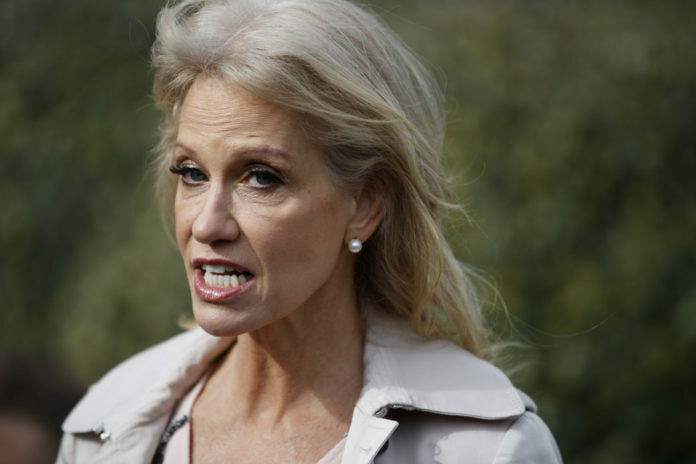 — A Maryland woman faces charges that she assaulted White House counselor Kellyanne Conway in front of her teenage daughter during a confrontation last year at a restaurant in a Washington suburb. Conway told police she was attending a birthday party Oct. 14 at a Mexican restaurant in Bethesda when she felt somebody grab her shoulders from behind and shake her, according to a charging document prepared by Montgomery County police. The woman who confronted Conway yelled, “Shame on you,” and “other comments believed to about Conway’s political views,” the document says. In a CNN interview broadcast Friday, Conway said she was standing next to her middle school-aged daughter and some of her daughter’s friends when the woman began shaking her “to the point where I thought maybe somebody was hugging me.” She said it felt “weird” and “a little aggressive,” so she turned around to face the woman. The restaurant’s manager told police the woman who confronted Conway had to be forcibly removed from the premises. Conway told police the woman yelled and gestured at her for 8 to 10 minutes before she was escorted out of the restaurant.